I'm going to introduce a brand that's new to me today. 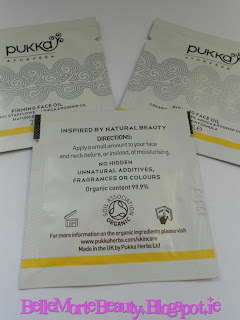 The brand is called Pukka Ayurveda and they specialise in organic skincare. I love to buy organic skincare products whenever I can as my skin can be at times on the sensitive side and I find that organic products with natural ingredients can be much kinder to my skin. The range is made with a blend of herbs and plant extracts. They also do not contain any parabens, petrochemicals, synthetic fragrances or colours which is good news for those of us who have sensitive skin or skin that is easily irritated. The range was developed Sebastian Pole who is billed as master herbalist and is the brains behind Pukka's organic tea blends. 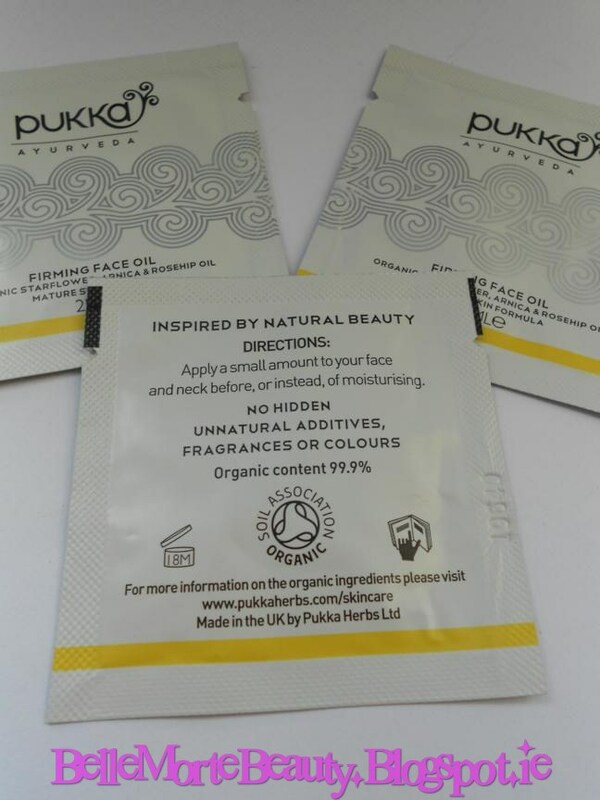 All of the products are made in the UK and contain 99.9% organic content. They are also approved by the Organic Soil Association. I recently received some samples of their Firming Face Oil to try out. 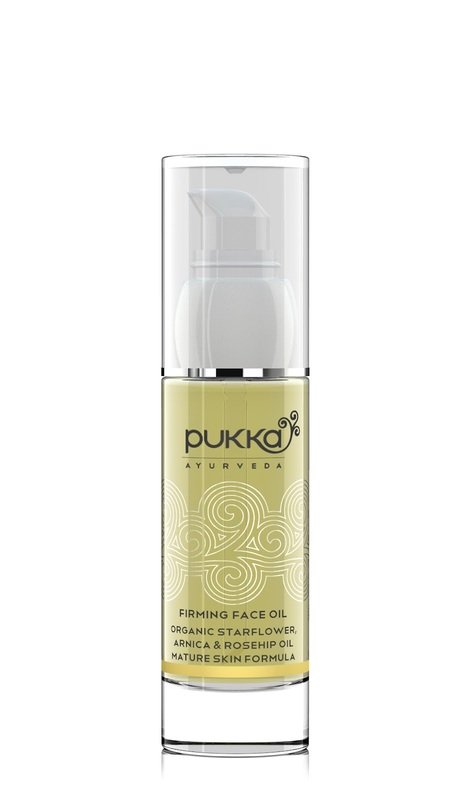 The Pukka Ayurveda Firming Face Oil contains organic starflower, arnica and rosehip. 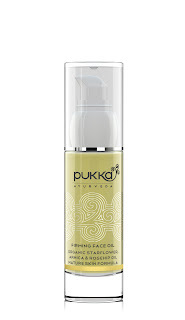 I have dry skin so I'm a big fan of face oils for their moisturising and nourishing properties. I like that this product has included rosehip in their formula as rosehip contains Omega 3, 6 & 9, essential fatty acids and antioxidants to restore optimum skin health. Rosehip Oil has been clinically tested and shown to help minimise the appearance of wrinkles, smooth skin and dramatically improve skin moisture levels. The face oil itself is free from any synthetic fragrance and it's very light and non-greasy formula. It can be used before moisturising or in place of your regular moisturiser. 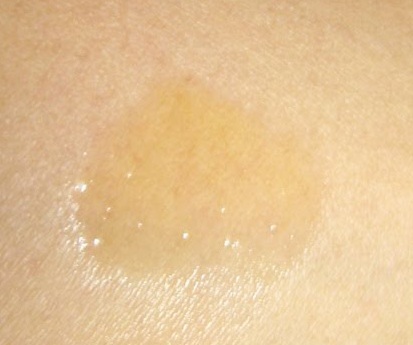 You apply the facial oil to your face and neck using upwards, circular motions. I found that it absorbed well into my skin leaving it feeling nourished and soothed. It was very light on my skin and didn't leave a greasy residue which I have found previously with other facial oils. The bottle comes in a generous 30ml pump - you only need a small amount so I can see a full size bottle quite some time. The addition of a pump is invaluable as I find you can waste a lot of with other traditional methods of dispensing facial oils. The oil is billed as "A restorative treatment oil especially formulated for mature skin, gently fragranced with soothing neroli and petigrain. It contains Mature Skin Formula, a fortified signature blend of Ayurvedic herbs which helps tone and condition aging skin." I haven't been using this product long enough to comment on it's toning and aging skin properties yet, however preliminary results were excellent - it left my skin feeling supple, soft and smooth and it really hydrated my dry skin, so I'll definitely keep using this and I'll be keen to try out the full size version of this product. news papers but now as Ӏ am a user of intегnet sо from now I аm usіng net fοг contеnt, thanks tο web.